When your Dallas wedding venue includes a terrific view of the iconic city skyline, you’ve got to make the most of it! Dallas-themed welcome bags: kick the party off right with Dallas-themed welcome bags placed in hotels rooms of traveling guests. You can include a list of favorite places to visit alongside other Dallas trinkets to thank out-of-town guests for their willingness to travel to your home city. 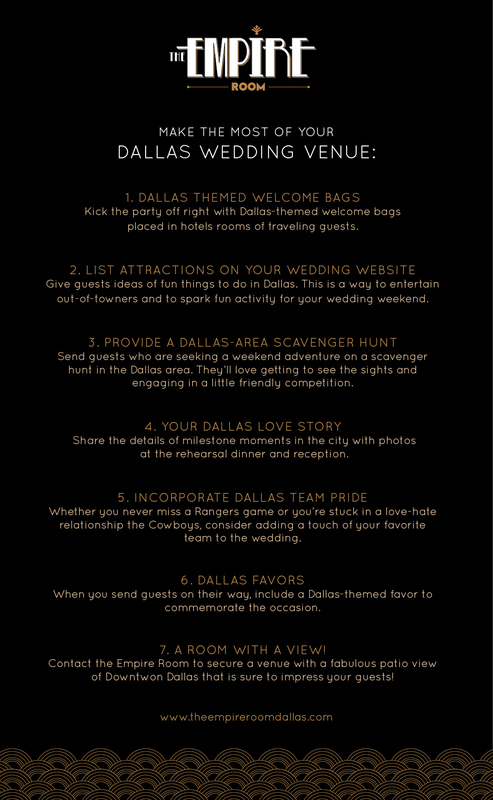 List attractions on your wedding website: give guests ideas of fun things to do in Dallas. This is a polite way to entertain out-of-towners and to spark fun activity for your wedding weekend. Select a few places you love most and include helpful website links to accommodate your guests. Provide a Dallas-area scavenger hunt: Send guests who are seeking a weekend adventure on a scavenger hunt in the Dallas area. They’ll love getting to see the sights and engaging in a little friendly competition. Even born and bred Dallasites will get a kick out of this one! Don’t forget to give away a grand prize at the reception! (a dance with the lovely bride always goes over well). Your Dallas love story: Did you fall in love here? Go on a first date? Get engaged? Share the details of your story with photos at the rehearsal dinner and reception. Your friends and family will love to see which city areas hold special importance to the happy couple. Incorporate Dallas team pride: whether you’re a girl who never misses a Rangers game or a guy stuck in a love-hate relationship the Cowboys, consider adding a touch of your favorite team to the wedding. Grooms’ cakes are a fun place to show sport loyalty! Dallas favors: when you send guests on their way, include a Dallas-themed favor. Graphic prints from Deep Ellum or framed maps of your neighborhood make for great keepsakes without going overboard on budget. Lastly, don’t forget to soak up the view at The Empire Room! You and your guests will be swept away by our outdoor patio and stellar view of Downtown. We hope you’ll add a touch of native pride to your Dallas wedding venue here at The Empire Room.